CHANGES to Victoria Legal Aid eligibility guidelines may breach Australia’s obligations to children under international law, lawyers say. Legal Aid announced the widest-ranging changes to its guidelines in its history last month as it braced itself for a deficit of more than $3.1 million this financial year. The deficit followed unprecedented demand for its services, which has been driven by the Victoria Police and the Baillieu government’s greater focus on preventing family violence. The first of the changes, which cuts funding for parents in family law disputes beyond trial preparation and only provides legal representation for them at trials when they are to face a lawyer, came into effect on Monday. The director of the National Children’s and Youth Law Service, Matthew Keeley, said Legal Aid’s funding crisis ”significantly reduced” children’s access to justice. ”The decision of VLA to so restrict its eligibility and the impact that that decision will have on children is such that one struggles to see how it considered that its decision could possibly be in the best interests of Victorian children,” he said. Australia is a party to the Convention on the Rights of the Child, which states that public bodies must consider the ”best interests” of children in all decisions relevant to them. ”Governments must also give thought to ensuring that the decisions they make do not either directly or indirectly discriminate against children … None of this has occurred as regards this decision,” Mr Keeley said. A spokeswoman for Victoria Legal Aid said ”prioritising the best interests of children” was key to the group’s decision to change its guidelines. Expert independent children’s lawyers, who help the court ensure outcomes are in a child’s best interests, would still be funded to ”represent children at final hearings where serious issues such as abuse have been raised”, she said. Other changes to Legal Aid’s guidelines to be implemented this year include one that would restrict legal aid grants in youth crime to children who are first-time offenders, most likely to go to jail or be placed under supervision. 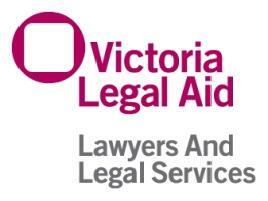 Those no longer eligible for grants will still be represented by Legal Aid’s staff lawyers. Mr Keeley said that unrepresented children might ignore court notices and could be convicted ”where otherwise they might have been acquitted”. He said that children in rural areas would be particularly affected by such changes because they had less access to youth diversionary programs than children in metropolitan Melbourne. The co-director of community legal centre YouthLaw, Tiffany Overall, said that a change to raise the age at which children could directly instruct their lawyers from seven to 10 might also limit their human right to participate in legal proceedings under the Convention on the Rights of the Child.